Rock &apos;n&apos; Roll Raleigh Marathon & 1/2 Marathon, presented by WRAL and benefiting the V Foundation, returns to Raleigh on Sun., Apr. 12! 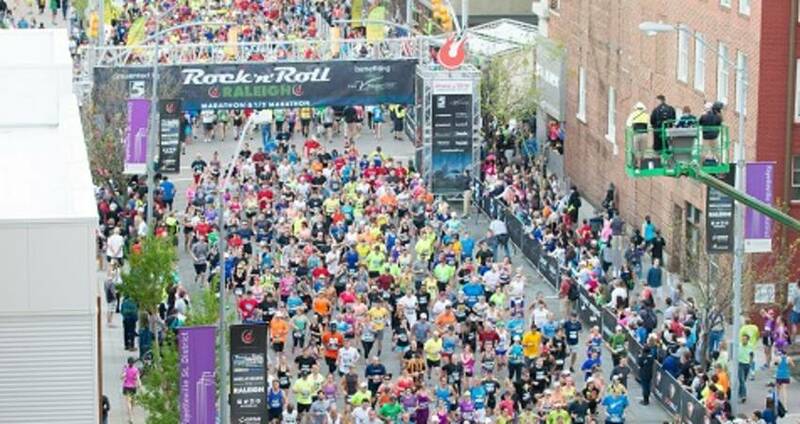 More than 8,000 runners representing 50 states and 10 countries will make their way to the area for race weekend. Boasting a thriving restaurant and craft beverage scene, the most live music in N.C., family-friendly museums and much more, there&apos;s a lot to pack in on a weekend visit to Raleigh. If you&apos;re coming into town for Rock &apos;n&apos; Roll, or have a friend or family member who is, here are a few suggestions on how to make the most out of the race weekend trip. Of course! The Health and Fitness Expo is where all runners are required to pick up their registration packet. In the Exhibition Hall of the Raleigh Convention Center, more than 80 exhibitors will offer free samples, showcase the latest in running gear and apparel, providing health and nutritional information and more. The Health and Fitness Expo will be open on Fri., Apr. 10, from noon-6pm and Sat., Apr. 11, from 9am-5pm. Live music will be played outside all day long on Sat. The Expo is free and open to the public. It&apos;s N.C. Beer Month, and Greater Raleigh is celebrating with a host of special events throughout Apr. Greater Raleigh has 18 breweries (and counting)—many of them offering weekend tours open for the public. On Sat., Apr. 11, World Beer Festival Raleigh is being held in Moore Square in downtown Raleigh—just a few blocks from the start and finish line of the marathon. A ticket to the event gets you a beer glass and unlimited four ounce samples of beers with more than 250 craft beverage options to choose from. For more Beer Month events, check out the full calendar here. Looking for something within easy walking distance of the middle of downtown? Hit up Crank Arm Brewing (BYOF—Bring Your Own Food), Boylan Bridge Brewpub (for beer, food and a perfect view of the Raleigh skyline) or make a quick jog down W. Morgan St. to Trophy Brewing Company for some of the best pizza and beer in town. The NHL&apos;s Carolina Hurricanes play their final home game of the 2014-2015 regular season on Sat., Apr. 11, at 7pm against the Detroit Red Wings. The Hurricanes play their home games at PNC Arena, just a handful of miles and a short drive from downtown Raleigh. Tickets can be purchased here, or at the PNC Arena box office on game day. While at the game, be sure to check out the local beers on tap plus some delicious N.C. barbeque at the concessions. Need transportation to and from? The Pepsi Caniac Coach will take you to and from PNC Arena from many restaurant/bar locations in downtown Raleigh and North Hills at no cost! Raleigh has lots of places to enjoy an easy shakeout run before the big race. One of the most popular? The trails at Umstead State Park. The Reedy Creek Trail connects Umstead State Park to the Museum Park at the North Carolina Museum of Art. Park for free at the museum and run into Umstead State Park to create a workout to your liking. Another option: park for free at the Old Reedy Creek Rd. entrance of Umstead State Park (map here) and run an out-and-back under the shade of the park trees on the Reedy Creek Multiuse Trail. Did you know that Raleigh has the most live music in N.C.? The most dates, the most venues, the most bands and the most genres! If you&apos;re looking for even more music, than you&apos;ll get on the course and at post-race concert (Smash Mouth! ), check out a full calendar of music happenings on themostnc.com. Also, don&apos;t forget: there will be live music from 10am-6pm outside of the Raleigh Convention Center on Sat., Apr. 11. Want more ideas? Send some questions to @visitRaleigh on Twitter. And don&apos;t forget to tag your social posts over the weekend with the official event hashtag: #RnRRAL.